If you work as a manager in an organization large enough to have dedicated human resources and finance functions, you will be well served to cultivate strong working relationships with the professionals on those teams. While building strong relationships with all of your peers across functions is a good practice, these particular groups can be some of your best advocates and allies in challenging situations. And, it pays to know just a bit about what makes these professionals tick. Here are a few approaches that will help you foster and strengthen these important relationships as you climb the corporate ladder. Reach Out: Take time to sit down with your primary contacts on these teams and share information about your group's mission and challenges. Be certain to ask the same about their focus and primary goals as a group. 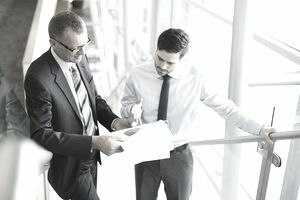 If you are a new manager, this is a great excuse to meet with your representatives from these teams and ask for their insights on their dealings with your group in the past. Ask for areas where they would like to see improvement. And then do something about it. Share the View From the Market: If you operate in a customer-facing group such as sales, marketing or customer support, extend invitations to your human resources or finance contacts to meetings where the focus is on sharing information about customers, competitors, and partners. Do not discount how important this is to people operating at least 1 degree of separation from the action in the market. While everyone recognizes the company’s need to acquire and keep customers, however for many who labor in internal facing groups, the realities of the marketplace are not tangible. They will appreciate your efforts to help them bridge this knowledge gap. Offer a Seat: Both human resources and finance should have a seat at the table when it comes to the work of planning for the future, yet in some firms, they are not directly involved in these important discussions. To the extent you can influence this issue, strive to involve these teams in the work of strategy. After all, the effort is much about engaging and focusing talent on opportunities to drive numbers. And the individuals in these groups are ultimately critical cogs in strategy execution efforts. Skip the Games When It Comes to Numbers: Depending upon your role, you will either work with finance on revenue and expenses or just expenses. For sales managers, finance gets the first and last vote on revenue recognition policies and decisions, so do not attempt to game the system. Be completely transparent with your team’s numbers and avoid any hint of gamesmanship. If you manage a cost center, be diligent about managing and forecasting your costs and bring potential problems to their attention immediately. There will be problem-situations, where your forthright behavior will buy you a bit of extra help when you need it. Create Positive Challenges: Everyone loves a positive challenge. Setting aside the benefits management side of human resources, your primary work with them will focus on finding talent and resolving problems with the talent on the team. Both are mission critical to your success and survival as a manager. Many of your hiring situations might be out of the ordinary as you invest in new markets and sought people with skills and experiences new to your culture. Your ability to work with human resources and tailor job requirements and search specifications will prove critical time and again in important recruiting activities. Offer Early Warning on Problems: Run, do not walk to offer early warning on problems. The problem situations are inevitable and the stakes for our organizations and careers are high when it comes to people issues. In many instances, your human resources contacts will offer guidance on how to navigate the situation and maintain corporate compliance. And if things go bad, they are the ones invited to facilitate cleaning up your mess, You will be glad you involved them early. Partner on the Big Projects: As you rise through the ranks, you will grow more dependent upon these teams to help you with large-scale initiatives. For one particularly complex and fast-moving restructuring, finance helped me evaluate our investment options and build forecast models. Their work was instrumental in gaining board of directors approval of our plans. Human resources brought the restructuring to life, helped us evaluate and develop new compensation packages, and enabled critical hiring activities as well as a few position eliminations. Help Them Achieve Their Goals: Tune in to their unique functional goals and support their efforts. Your willingness to provide resources for an important project or to pilot a new process or policy will be appreciated and remembered. It is easy to view the shared services functions as just part of the process. In reality, finance and human resources, in particular, enable you to understand your business, invest for the future and deploy, manage and develop the talent needed to succeed. Build strong relationships with every group in your firm, however, a little bit of extra effort with these two teams will pay dividends.